This Fuel Pump Filter Canister is not unique to the Carryover 1966 Shelbys, but it is a very nice part and detail to add during a restoration. This canister was originally installed on all ’65 Mustangs with the canister style fuel pump. This included the Carryover GT350’s. This canister features the correct double ribbing, white paint and red silkscreen. The silkscreen has the the wording, font and FoMoCo logo to match the original. 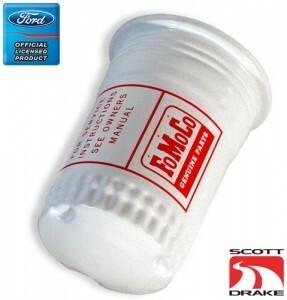 You can order this Fuel Pump Filter Canister by clicking here. You can read more about the Fuel Canister by clicking on this Blog Post.